I don’t have profiles for Hina and Rina since their match is just an exhibition, but everyone else on the card has a profile which you can go straight to by clicking on their name. As this aired on Stardom World, it is unclipped. The match has a five minute time limit. I probably shouldn’t even review this since its an exhibition match with three children, but I try to cover everything. Hina and Rina are sisters of Hanan, and also fraternal twins. I am not sure of their ages, but Hanan is 12 so the twins are younger than that. I have no idea if Hina and Rina will continue showing up in Stardom or if this is a one time thing, I guess we will find out shortly. Rina starts the match with Hanan, wristlock by Rina but Hanan quickly reverses it. Hanan takes Rina to the mat, they return to their feet and trade wristlocks until Rina tags in Hina. Hina comes in the ring with an ax handle to Hanan’s arm, they both club each other in the chest but both kip back up. Inside cradle by Hina, and she tags in Rina. Hina and Rina both kick Hanan into the corner before hitting dropkicks, Rina goes for an STO but Hanan blocks it and tries to put Rina in a crab hold, but Rina keeps rolling out of it. Hanan slams Rina into the corner but Rina reverses the scoop slam into an inside cradle. Dropkick by Rina, Hanan does go down but Hina comes in and together they hit a double STO for a two count. Hina stays in the ring and they go for another one, but Hanan blocks it and flings both to the mat. Hanan puts Rina in a crab hold but Rina crawls to the ropes to force the break. Rina tags in Hina, judo toss by Hanan but Hina hits one of her own and puts Hanan in a Gedo Clutch for two. Back up, Hina goes for a scoop slam but Hanan blocks it and hits one of her own. She slams Rina as well before putting Hina in a crab hold, but the bell rings before Hanan can get the submission. The match is a Draw. Better than it had any right to be, but I am sure it helped that since all are sisters not only have they probably “rough housed” before but had time to discuss the match layout. Hina and Rina clearly also train in sports, looks like judo just like their sister, as they are fairly agile for kids their age. Just a fun little exhibition match, but I do think if Hanan sticks around that she has a lot of promise. I actually have lower expectations for this match than I did the last one. Take that as you will. While Hetzza is an adult, she is probably on a similar experience level as AZM, she is a young wrestler from the WWS promotion in Mexico. 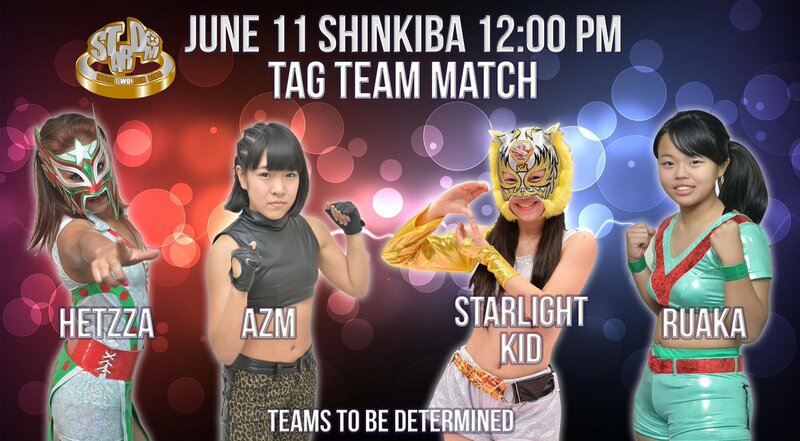 This is Starlight Kid’s return match, she took a long break from Stardom (likely to concentrate on school) and teams with 12 year old rookie Ruaka. So without a strong veteran presence to guide the match, I’m not really sure how this one will go. Ruaka and Hetzza kick things off, they trade wristlocks until Hetzza armdrags Ruaka to the mat. They both tag out, AZM and Starlight Kid trade elbows back and forth until AZM trips Starlight Kid and dropkicks her. Starlight Kid flips back to her feet and goes to tag out, but AZM cuts her off and throws Starlight Kid into her own corner. AZM tags Ruaka, Ruaka boots Starlight Kid in the chest before AZM stomps down onto her back. Crab hold by Ruaka, but Starlight Kid crawls to the ropes and forces the break. Ruaka charge Starlight Kid but Starlight Kid drops her onto the second rope, she goes for a Tiger Feint Kick but Ruaka ducks it and hits a reverse STO. Ruaka goes for a big boot but Starlight Kid ducks it and rolls her up, standing moonsault by Starlight Kid but the cover gets two. Starlight Kid gets to her corner and tags Hetzza, jumping lariats by Starlight Kid and she covers Ruaka for two. Cradle by Hetzza, AZM breaks it up and Ruaka hits Hetzza with the reverse STO. She tags in AZM while Starlight Kid is also tagged in, dropkick by AZM and she hits rolling vertical suplexes for a two count. AZM jumps on Starlight Kid’s back but Hetzza runs in and drops AZM with a lariat, Tiger Feint Kick by Starlight Kid to AZM and she gets on the second turnbuckle, hitting a diving body press for a two count. Starlight Kid goes to the second turnbuckle again but Ruaka boots her off, kick by AZM to Starlight Kid and they trade flash pins. Starlight Kid goes for the standing moonsault but AZM avoids it, Japanese Rolling Clutch by AZM and she picks up the three count! AZM and Ruaka are the winners. Inoffensive, although too short to be meaningful. This mostly just re-establishes that AZM is above Starlight Kid in the pecking order, which we kinda assumed anyway. Plus it gives young wrestlers experience which is never a bad thing. Skippable, but not unwatchable. Shanna has returned to Stardom! This is her first tour with the promotion since last August, she is a Portuguese wrestler that wrestles in promotions all across Europe. Rebel is still in Stardom as her stay got extended, she is best known for her work in TNA, while Hiromi Mimura and Konami are what is left of The Chibis faction after Kairi Hojo left for greener pastures. Rebel and Shanna won’t shake hands before the match, so Hiromi and Konami stomp on their feet. Elbows by Rebel and Shanna but both eat dropkicks, more strikes by Konami and Hiromi and they toss Rebel and Shanna out of the ring. Konami slides Shanna back in for Hiromi, dropkick by Hiromi but Shanna boots her in the face. She tags in Rebel, Rebel swings Hiromi around by her hair before Shanna comes in to help double team her. Rebel and Shanna pose on Hiromi near the ropes, Hiromi fights back with elbows however and hits a quick DDT. This gives her time to tag in Konami, Konami comes in the ring with a missile dropkick and dropkicks both Rebel and Shanna into the corner. More kicks by Konami to Rebel and she delivers a dropkick for a two count. Sleeper by Konami but Rebel manages to fling her off, Konami goes off the ropes and hits a sliding kick for a two count. Rebel catches Konami with a front suplex, Rebel picks up Konami and hits a shoulder breaker for a two count. Rebel tags in Shanna, Shanna goes up top and hits an ax handle onto Konami’s back. Running elbows by Shanna in the corner and she hits a crossbody, Shanna goes up top but Konami recovers and joins her. Shanna headbutts Konami into the Tree of Woe and hits a footstomp onto her chest, cover by Shanna but it gets a two. Shanna goes for the dragon suplex but Konami blocks it and kicks Shanna in the head. Konami makes the hot tag to Hiromi, dropkick by Hiromi and she puts Shanna in a headlock. Shanna gets out of it but Hiromi hits a jumping crossbody for another two count cover. Hiromi charges Shanna but Shanna catches her and slams Hiromi to the mat. Superkick by Shanna, she picks up Hiromi as Rebel goes for a dive on them, but Hiromi moves and Rebel hits Shanna by accident. Konami comes in and they both attack the Gaijin in different corners, Hiromi covers Shanna but it gets two. Hiromi and Konami both hit running strikes on Shanna, Hiromi goes up top and she hits a diving crossbody, but Rebel breaks it up. Konami kicks Rebel out of the ring, Shanna goes for a dragon suplex onto Hiromi but Hiromi reverses it into a roll-up for two. The La Magistral gets the same result for Hiromi, enzuigiri by Shanna to Hiromi but Konami breaks up the cover. Rebel comes in and hits a flapjack on both Hiromi and Konami, Shanna picks up Hiromi and delivers a lifted double underhook DDT for the three count cover! Shanna and Rebel are your winners. Well this wasn’t good. I didn’t think that Shanna clicked the last time she was in Stardom and I continue to think that, she had a good match against Io but against younger or less experienced wrestlers the chemistry just isn’t there. Rebel is Rebel, and a lot of offense on both sides just looked rough. Konami is great and continues to be great, but she couldn’t save this one. Team Jungle Collide! 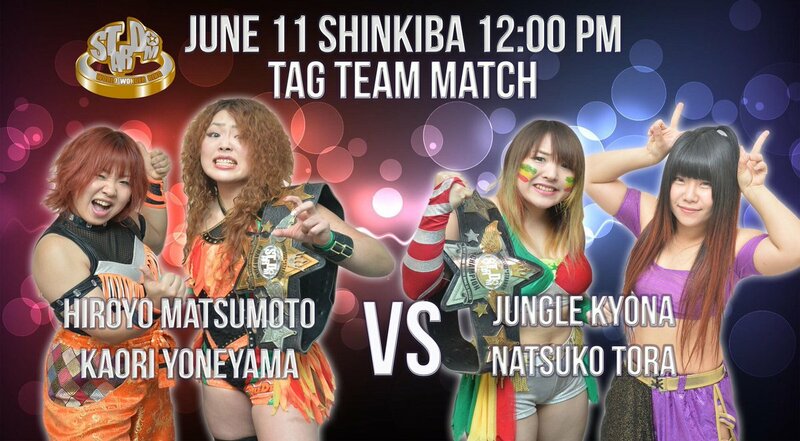 The “Team Jungle” faction includes all four of these wrestlers, and Hiroyo and Jungle were already the tag team champions at this point so there wasn’t any animosity for this match. More of a ‘friends taking on friends to see who is better’ type deal, plus with it being a smaller show they needed matches to fill the midcard. Natsuko has been pretty solid for a rookie though and Kaori is better than she gets credit for since she wrestles early on the cards, so I expect this to easily be the best match on the show so far. Jungle and Natsuko both attack Hiroyo as the match starts, since there are no rules in the jungle, Kaori comes in to help but Jungle tosses her out of the ring. Natsuko and Jungle both shoulderblock Hiroyo to the mat, Kaori returns but Jungle suplexes her next to Hiroyo. Natsuko hits a running senton on both of them, Jungle goes for a body press but Hiroyo moves so she only hits Kaori. Jungle is knocked out of the ring, leaving just Hiroyo and Natsuko as the legal wrestlers. Hiroyo shoulderblocks Natsuko and catapults her into the mat, Kaori runs in and hits a senton before Hiroyo connects with a dropkick. Hiroyo tags in Kaori as they take turns beating down the rookie, but Natsuko plants Kaori with a spear and makes the tag to Jungle. Jungle shoulderblocks Kaori but Jungle snaps her neck over the top rope, she gets in the ring but Jungle hits a jumping crossbody onto both of them. Jungle picks up Kaori and slams her upside down in the corner, Natsuko comes in and both connect with running strikes. Jungle covers Kaori, but it gets a two count. Jungle picks up Kaori but Kaori quickly hits a DDT and knees Jungle in the back of the head. She tags Hiroyo, Hiroyo goes up top and delivers a missile dropkick for two. Hiroyo gets Jungle on her shoulders, Natsuko runs in but Hiroyo throws Jungle at her. Hiroyo slams Jungle in front of the corner and gets on the second turnbuckle, but Jungle recovers and suplexes Hiroyo back down to the mat. Jungle goes for a deadlift but Hiroyo gets out of it, both wrestlers go for lariats but Hiroyo wins the battle. Hiroyo gets Jungle on her shoulders and hits a gutbuster, cover by Hiroyo but it gets two. She tags in Kaori, running senton by Kaori but Jungle blocks the suplex attempt and hits a short-range lariat. This gives her time to tag in Natsuko, shoulderblocks on Natsuko and she covers Kaori for two. Kaori elbows Natsuko away from her and hits a knee, she goes off the ropes but Natsuko knocks her over with a shoulderblock. Kaori comes back with a running knee, Northern Lights Suplex by Kaori but Natsuko gets a shoulder up. She goes for another one but Natsuko blocks it, Natsuko goes for a few flash pins but has no luck. Side Russian Leg Sweep by Natsuko and she puts Kaori in a submission, roll-up by Natsuko but it gets two. Natsuko hits a diving senton but Hiroyo breaks up the cover, clubs by Jungle but Hiroyo hits a backdrop suplex on both of her opponents. She puts Jungle on her shoulders, Kaori then jumps on too before Hiroyo hits a double kneedrop onto Natsuko. Kaori goes up top and nails the diving senton, cover by Kaori and she gets the three count! Hiroyo Matsumoto and Kaori Yoneyama win! This match has a bit of a history to it, which I’ll try to very briefly summarize. Mayu has been a bit “lost” lately so Hana tried to talk Mayu into joining Oedo Tai. 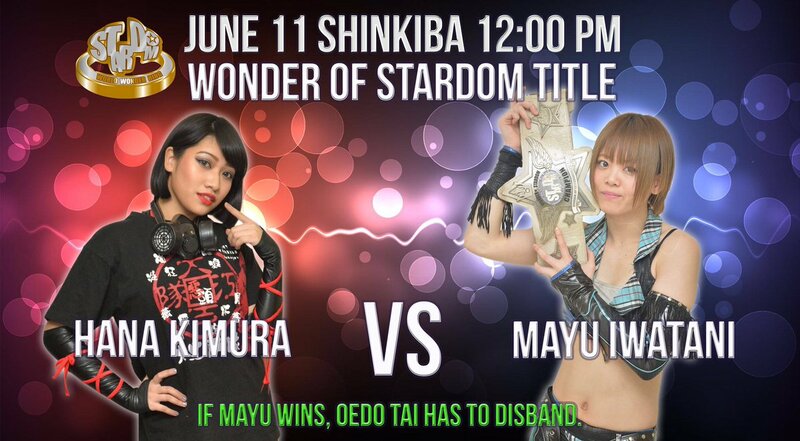 When Mayu gave her a final ‘no’, this match was formed with the stipulation that if Hana Kimura loses, then Oedo Tai will disband. Mayu’s issues with Oedo Tai run deep, after she feud with Kagetsu last year, so it just adds a bit of extra importance to the match. Oedo Tai is a bit bare right now with Kris Wolf in England and Kagetsu MIA, so Hana was basically a one-woman faction at this point. Hana poses to start the match, she challenges Mayu to do the same but then dumps Mayu out of the ring when she finally does so. Hana tosses Mayu around the ring before choking her with a chair, she gets a parking cone and hits Mayu repeatedly with it. Hana rolls Mayu back into the ring and stomps down on her leg, she puts Mayu’s leg on the second rope and dropkicks her in the knee. Hana keeps on Mayu’s leg and stomps on her head a bit, she goes off the ropes but Mayu catches her with a back elbow. Hana comes back with a knee, she goes for a vertical suplex but Mayu blocks it and puts Hana in a guillotine. Back kick by Mayu, she goes off the ropes and dropkicks Hana in the chest for a two count cover. Mayu goes for a superkick but Hana catches her leg and puts Mayu in an ankle hold. Mayu eventually gets into the ropes for the break, Hana stomps on Mayu and hits a pair of running boots. Cover by Hana, but Mayu gets a shoulder up. Hana puts Mayu on the top turnbuckle and joins her, superplex by Hana and she covers Mayu for another two count. Hana goes up top and hits the missile dropkick, but Mayu barely kicks out in time. Sleeper by Hana but Mayu gets into the ropes, she goes up top again but Mayu kicks her before she can jump off and suplexes Hana to the mat. Mayu gets on the second turnbuckle and hits a diving footstomp, Mayu goes for the dragon suplex but Hana blocks it and slaps Mayu in the face. Dropkick by Mayu, she goes for a superkick but Hana schoolboys her for two. Mayu goes up top and nails the Frog Splash, she drags up Hana and goes for the dragon suplex, but suddenly Kagetsu appears and hits a swandive dropkick from the apron! She dropkicks the referee too, and at some point in his Hana Kimura is DQed. Your winner is Mayu Iwatani! Kagetsu and Hana beat up Mayu for a few minutes, Kagetsu then gets on the microphone and says that Oedo Tai isn’t ending, but only getting stronger. And we end the evening with a singles match between two members of Queen’s Quest. Like the Team Jungle match earlier, this isn’t a heated match of course, but rather HZK wanting to show her growth and test herself against the best. Io, being a good mentor, is open to giving her pupil the chance to knock her off the ladder (or at least show her growth in the process). An interesting main event to be sure, hopefully HZK can step up and deliver. They shake hands before going into a tie-up, they trade holds but they end up in a stalemate. Irish whip by Io but HZK kicks her in the stomach, double front flip by Io and she delivers a dropkick. Io charges HZK in the corner but HZK moves, HZK goes for some kicks but Io catches one and elbows HZK in the face. HZK boots her back but Io connects with a dropkick, missile dropkick by Io and HZK rolls out of the ring. Io gets a running start in the ring and dives out onto HZK with a plancha suicida, she rolls HZK back in and stomps her repeatedly. Io picks up HZK and hits a scoop slam, handstand kneedrop by Io and she covers HZK for two. More stomps by Io, she goes off the ropes but HZK catches her with a double chop to the chest. Scoop slam by HZK in front of the corner, she goes up to the second turnbuckle but Io joins her, Io goes to do a Frankensteiner but HZK slides between her legs and knocks Io out of the ring. HZK goes up top and dives down onto Io with a plancha suicida, she slides Io back into the ring and bootscrapes her against the ropes. Running boot by HZK and she puts Io in the armtrap crossface, but Io makes it to the ropes to force a break. HZK pulls Io out onto the apron and goes for a slam, but Io blocks it and the two trade elbows. Big boot by HZK out on the apron, she picks up Io and hits a Michinoku Driver onto the apron as well. HZK quickly rolls Io back into the ring, she goes up top and nails a diving senton, but Io kicks out of the cover. HZK goes off the ropes but Io rolls her up and hits a footstomp, dropkick by Io and she covers HZK for two. Running double knee by Io in the corner, she goes for a suplex but HZK rolls her to the mat and hits her own footstomp. Scissors kick by HZK and she applies a rolling cradle, but it only gets a two count. HZK goes up top and goes for the Bombs Away, but Io rolls out of the way and delivers a German suplex hold for two. Io goes to jump to the top turnbuckle but HZK pulls her back down, HZK goes up top instead and she hits a diving elbow drop, but Io gets a foot on the ropes. HZK picks up Io but Io reverses the Michinoku Driver into a tombstone piledriver. Io quickly goes up top and she nails the moonsault, cover by Io and she gets the three count! Io Shirai is the winner. While just a house show for Stardom, there was a fair amount of worthwhile wrestling on this event. The event started slow as the first three matches are skippable, but the next three all had something worth watching for. 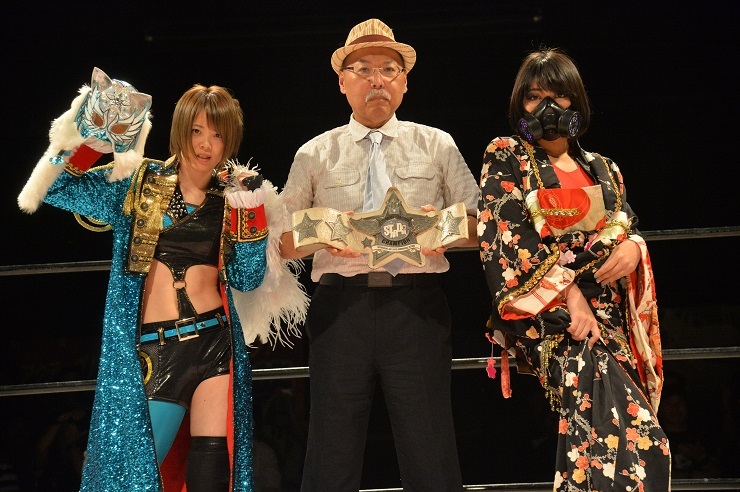 Team Jungle is a fun faction, while the Mayu/Hana match had an important storyline element with the return of Kagetsu. The main event won’t rock anyone’s world but they both put in maximum effort and I really enjoyed it. Top to bottom a fairly decent card, no MOTYC but generally an easy casual watch.